KrioRus is a Russian firm that claims to have succeeded in developing brain-freeze technology that will let you live on indefinitely. ...clients of Russian cryonics company KrioRus believe the brain operates like a computer hard-drive and its contents can be frozen and stored for the future. "We know that the personality is stored in the brain. So when a person's body is old, there's no reason to keep it," said Danila Medvedev, who runs KrioRus, the first cryonics outfit outside the United States. "We tell our clients it's cheaper, safer and probably better preservation just to freeze the brain," said Medvedev, a smart executive sporting a suit and an iPad. Cryonics -- or the freezing of humans in the hope of future resuscitation -- is illegal in France and much of the world, but KrioRus has stored four full bodies and eight people's heads in liquid nitrogen-filled metal vats. 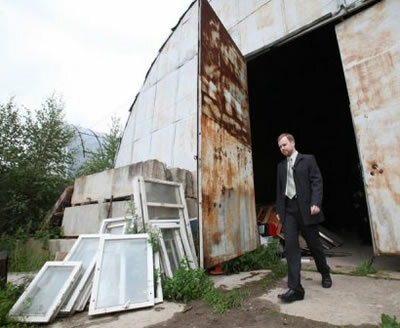 While a few are kept at home by their client's relatives, most are lumped together in containers at the firm's rusting warehouse, where an old desk now serves as a step to allow visitors to peer into the icy-mist where the bodies are stored. "You would just need to launch their hearts... then you have a person who is living again," Medvedev said, counting on the swift progress of nanotechnology and medicine to help reverse the initial cause of death. 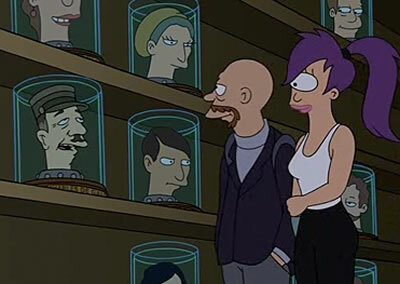 Fans of Futurama are readily familiar with scenes like this one - inside the brain warehouse. Yet the boy was right; shape was irrelevant in defining "Man", as unimportant as the bottle containing the wine. You could even take a man out of his botle, like that poor fellow whose life those Russians had "saved" by placing his brain in a vitreous envelope and wiring him like a telephone exchange. See also the reference for Roger Zelazny's EverRest Cryotorium and of course Frederik Pohl's corpsicle. Via Physorg; their article also gives space to the skeptics who think that this technology might not work (gasp!). Thanks also to Moira for contributing the tip and a reference for this story.